Nedunganad is a patch of land which once extended from Kalladikkode hills in the east to Kunnamkulam/Chavakkad in the west between the Bharathappuzha and Toothappuzha rivers. It had only a brief existence as an independent principality - perhaps from 11th to 13th centuries. It was conquered first by Valluvakkonathiri and in the 14th century by Zamorin. Nedungadis ruled the place with Cherpulasseri as their capital. As with many other principalities, internecine conflicts led to its disnintegration. It was particularly poignant in the case of the Nedungathiri of Nedunganad, as he had sought the help of the Zamorin primarily to contain the growing might and arrogance of the four Nayar families. Instead, the Eralppad overran the province through his triumphant march (Kottichezhunnallaththu) which was celebrated annually as a commemorative event. Rajendu has mixed historical documents (some of them published for the first time) with local legends as supportive evidence and has cleverly woven a cultural history of the area which had a rich tradition centred around temples and a few Nayar swaroopams. The earliest document which mentions Nedunganad is the Nedumpurayurnattu Tali inscription which has been dated at 900 A.D. 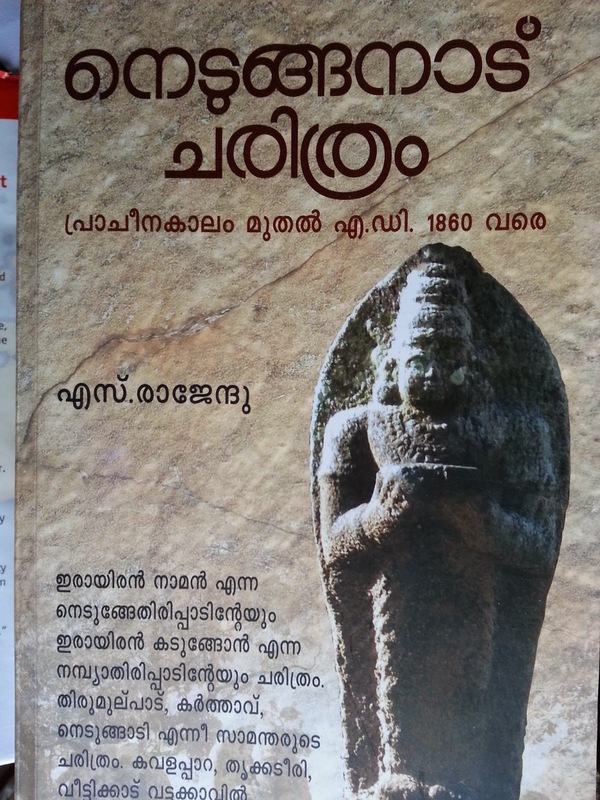 This is an original discovery by the author and testifies to the antiquity of not only Nedunganad, but other neighbouring areas like Palakkattucheri, Pallippuram, Eashanamangalam and Vengannur. Some of his observations make interesting reading. For instance, it is a matter of record that the Zamorin invaded Valluvanad primarily to gain access to the rich paddy lands, as Calicut was chronically deficit in rice. But, the Zamorins' weakness for the broken rice of Chunangad is an interesting aside. It appears that even today, the palppayasam offering at Guruvayur Temple uses this particular rice. Again, when the Nedungathiri approached the Zamorin for his help in suppressing the Nayar chieftains of his province (Kavalappara Nayar, Thrikkiteeri Nayar, Vattakkavil perumpada Nayar and Veettikkadu Kannambra Nayar), Zamorin was not very keen, as his forces had been over-committed. Nedungathiri then noticed the Eralppad who was standing nearby and pointing out to him suggested that this fellow (iyaal) could be sent instead. It was obvious that the Eralpad did not like the form of address and he showed his displeasure as soon as he had reached Thootha river, heading a small army. He was incensed that Nedungathiri had not made proper arrangements for lunch for his army. Meanwhile, the Nayar chieftains saw this as an opportunity to deflect the invasion and had arranged a sumptuous lunch. All the three Nayar chieftains (except Kavalappara who had a standing army and was in some way connected to the Cochin dynasty) surrendered to the Eralpad. Ultimately, Zamorin's forces overran Nedunganad and established Eralpad's headquarters in Karimpuzha. The book is an invaluable collection of old records including memoirs of persons like Vidwan Kovunni Nedungadi, recollections of family history handed down from generation to generation, a description of a Kottichezhunnallaththu which took place more than a hundred years ago (the description of how the Eralpad boards a train from Calicut to Pattambi and alighting there, proceeds to head the procession of the army lends an air of incongruity), Nedunganadan versions of Keralolpathi and Kerala Mahatmyam and some original inscriptions which the author has discovered through patient research. We strongly commend this book as a pioneering effort to record the history of Nedunganad. Thanks CHF for writing about this book, It is a very nice reference book on the people of Nedunganad.Picked it up a couple of years back and am still perusing it. Did he not write a second book? Yes, Maddy. He has written a book on 'Atakkaputhoor Nattupazhama' which is a sort of memoirs of M.P. Mohandas Master. We shall review it as and when a copy is available.